"She wore a white Chanel lace dress with a bolero and roses in her jet-black hair; her high cheekbones were heavily rouged." 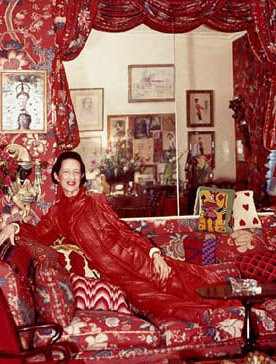 Diana Vreeland is offered a job at the famous Harper's Bazaar by the editor-in-charge, Carmel Snow. It was 1936, the year when Diana accepted the job and begun her reign at the magazine. This is what she said about her financial status at that time: "I was going through money like one goes through... a bottle of scotch, I suppose, if you're an alcoholic." She was on the way of becoming one of the most appreciated voices in the fashion industry and a fashion icon. Diana worked as fashion editor at Harpers Bazaar for the next 25 years. In 1963 she joined Vogue, where she was editor-in-chief until 1971, when she was fired. During that time she discovered Edie Sedgwick. She then moved on in being creator at the Metropolitan Museum of Art’s Costume Institute. Diana's family emigrated to New York, where they became prominent figures in society. She was just an ordinary girl alongside the beauties she had in the family: her mother Emily was called the "Society Carmencita" while her sister was blonde and angelic, unlike Diana with her dark curly hair. Her mother even told her once: "It's too bad that you have such a beautiful sister and that you are so extremely ugly and so terribly jealous of her. This, of course, is why you are so impossible to deal with." Actually, Diana was considered by most to be very ugly. An American journalist even suggested that her looks were reminiscent of a cigar store wooden Indian. While "agreeing on practically nothing" with her mother, Diana started the search of girls or women to idealize for their perfection. Since she had never discovered them, Diana decided that she will be that girl, perfecting her vocabulary and manners and surprised everyone with the way she dressed. In 1924, Diana marries Thomas Reed Vreeland, a banker, at St. Thomas' Church in New York, with whom she would have two sons: Thomas Reed Vreeland Jr., and Frederick Dalziel Vreeland. They later move to London and Diana operates a lingerie business near Berkeley Square. She lead a very luxurious life in London and enjoyed playing tennis with Gertrude Lawrence in Regent's Park every morning. As a columnist, Diana stood up from the start, by asking her legendary question "Why don't you...?" Diana created the modern view on what a fashion editor should be. Until then, a fashion editor was a society lady doing nothing more than putting hats on other society ladies. 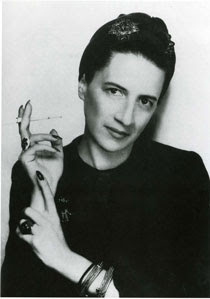 Vreeland believed in expressing personality and didn't credit promoting the so-called society in the pages of the magazine. Instead of simply reporting the styles and trends of fashion, Diana began to create and promote certain objects, attitudes and ideas. She did this with her legendary remarks, packed with wit and humour, keeping the American public, especially women, always wanting more: “The bikini is the most important invention since the atom bomb”, “Never fear being vulgar, just boring”. 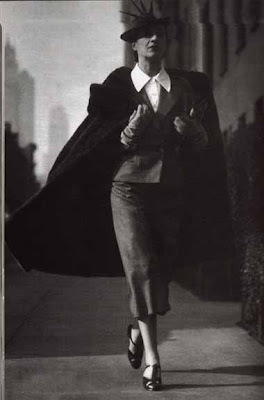 As for the fashion world, couturiers were drawn in by her originality and effervescent personality. So they offered her the clothing and accessories for nothing, in exchange for her chic manner and visibility. She was a friend to Coco Chanel, The Duke and Duchess of Windsor, photographer Cecil Beaton, composer Cole Porter. Not only Diana herself was unique, so was her apartment on Park Avenue. Original to the limits, Diana wanted her apartment to look like a garden in Hell. She worked on this project with Billy Baldwin, a famous New York decorator. The actual décor didn't look like a garden in hell, but it certainly suggested it. There were used lacquer reds and scarlet coloured floral wall coverings, lots of paintings and books. The center of the living room was a taken by a bright red sofa on which there were piled an impressive number of cushions.